Are you a laptop user and fed up with heating? Well, we have compiled list of best laptop cooling pads especially for you so you won’t complain about heating. Laptop owners or you can say users generally complain about the heat because they use it more than 8 to 9 hours a day and sometimes more. Gamers, an Employees, Movie or Series lover uses laptop for whole day and end up with immense heating issues. To cool down your laptop you must shut down it or should use laptop cooling pad. Most users don’t know which cooling pad is best for their laptop because they might own different sized laptop, more hours of use and other reasons. Here, we have compiled best 7 laptop cooling pads which helps you to choose best cooling pad (fan) for your laptop. Tree New Bee Laptop Cooling pad is one of the best selling cooling pad on Amazon. This laptop cooling pad is compatible with 15.6 to 17 inch laptop range which is quite amazing. Tree New Bee Laptop cooling pad comes up with four 120 MM cooling fans at 1200 RPM speed. This laptop cooling pad is very slim, portable, light weight and affordable for every laptop so you can take it anywhere. Tree New Bee laptop cooling pad has adjustable height so you can set it as per your comfort. This laptop cooler is not just attractive but beast in terms of performance and will definitely reduce the heat of your laptop. It has best typing angle after placing your laptop on it so you don’t have to worry about your back and neck pain now. Tree New Bee Laptop Cooling Pad’s fans are not that much noisy so it won’t disturb you while working. Cons – We have read few online reviews where people find the consistency issues. HAVIT HV-F2056 Laptop Cooling pad is also Amazon’s choice and best selling cooling pad on Amazon. This laptop cooling pad is compatible with 15.6 to 17 inch laptop range three cooling fans. HAVIT manufactures quality laptop cooling pads and have good online reviews. HAVIT laptop cooling pad is very slim and portable and worth investment for your laptop. This Laptop cooling pad has high-quality multi-directional metal mesh which provides your laptop with a wear-resisting and stable laptop carrying surface so your laptop won’t move while using it. HAVIT Laptop Cooling pad is very slim and it can fit into your backpack as well easily. Cons – After analyzing online reviews and ratings existing users suggests that the cooling fans are not producing much air thus it’s quiet but it cools down your laptop. Otimo Laptop Cooling Pad is beast of all cooling pads. This is the most attractive cooling pad compatible with 12 to 17 inch laptops and that’s the best thing about it. This laptop cooling pad has 5 ultra silent cooling fans and powered with 2 USB ports. It has also adjustable angled stand you can adjust the height of your laptop cooling pad as well as per your comfort. Otimo cooling pad is very convenient and portable so you can take it anywhere with your laptop. TeckNet is one of the most affordable and cheap laptop cooling pad one can ever have. Despite of low prices we have seen such amazing reviews on amazon and that too positive. This TeckNet laptop cooling pad has 4.5* reviews on Amazon and comes up with 2 cooling fans. TeckNet Laptop cooling pad is compatible with 12 to 16 inch laptop and that’s the main reason one should buy this cooling pad. This laptop cooling pad is very slim and portable along with 2 USB Ports. TeckNet Laptop cooling pad is compatible with Apple Macbook Pro, Air, Alienware, Dell, Lenove, ASUS and more. As mentioned earlier HAVIT is one of the best manufacturers of Laptop Cooling Pads and many users are already using it. This Laptop Cooler Pad has 5 cooling fans comes up with LED Light and USB 2.0 Ports. It has also adjustable mount stand so you can adjust the height of your cooling pad according to your comfort. HAVIT Cooling Pad has 5 cooling fans in which one fan is bigger in size (110 MM) and 4 small size fans (85 MM). This laptop cooling pad also has the 30 Days money back gurantee and full 1 year Manufacturer’s warranty and free life time support. Con’s – USB Ports not compatible with high power devices. TensWall Laptop Cooling Pad is also very quality cooling pad because of the material design and quality. Tenswall laptop cooler is compatible with 11 to 17 inch laptops. This Laptop cooling pas has 4 cooling fans and it’s quite big in size. It is very powerful and extremely quite despite of 1200 RPM speed. It cools down your laptop quickly and you won’t feel any heat while using your laptop. This laptop cooling pad is compatible with Apple Macbook Pro Air, Hp, Alienware, Dell, Lenovo, ASUS, etc. DC Fans’ Sizes: 110mm L x 110mm W x 20mm H x 4,(4.33in.L x 4.33in.W x 0.79in. H x 4). 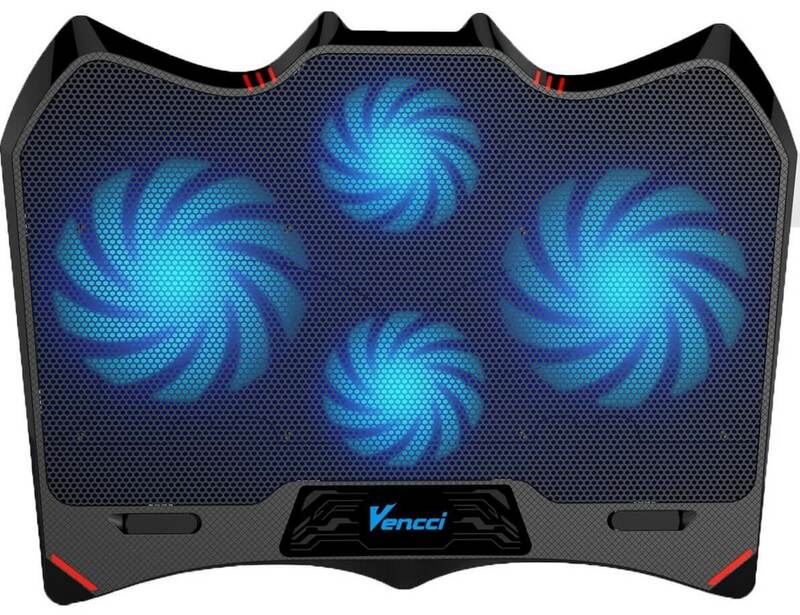 Vencci laptop cooling pad is best affordable cooling pad available in the market under $20. This Vencci laptop cooling pad is compatible with 10 to 17 inches laptop with adjustable mount stand. Vencci Laptop cooling pad has 4 cooling fans in which 2 cooling fans are larger in size and 2 cooling fans are smaller in size. This cooling pad is extremely portable for your laptop and you can carry it anywhere.